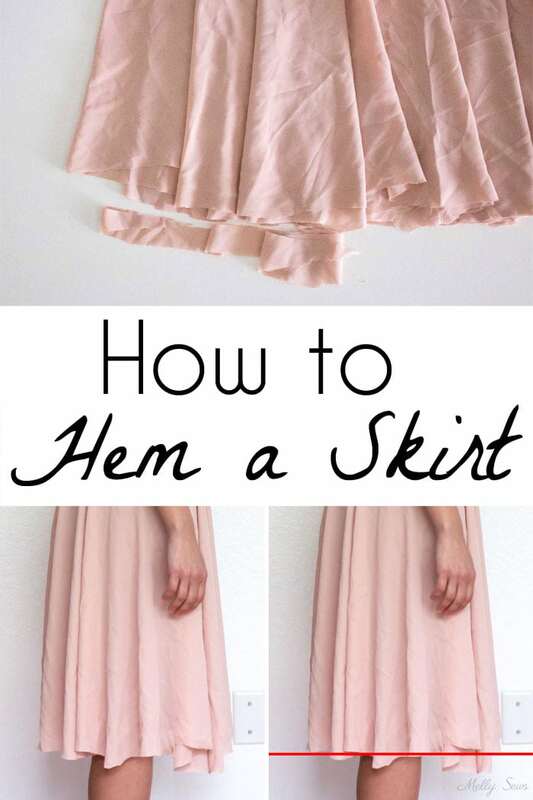 Hey y’all, today we’re going to talk about how to hem a skirt. Have you ever watched Project Runway and seen Nina and the others criticize a crooked hem? Hems are the quickest way to take your garment from handmade to homemade, and not in a good way. An even hem starts with precise cutting and sewing, but I’m going to assume you did those steps. So how come even when you’re super careful, you can end up with a hem that looks like the one below. Well, the skirt hanging above is a circle skirt. 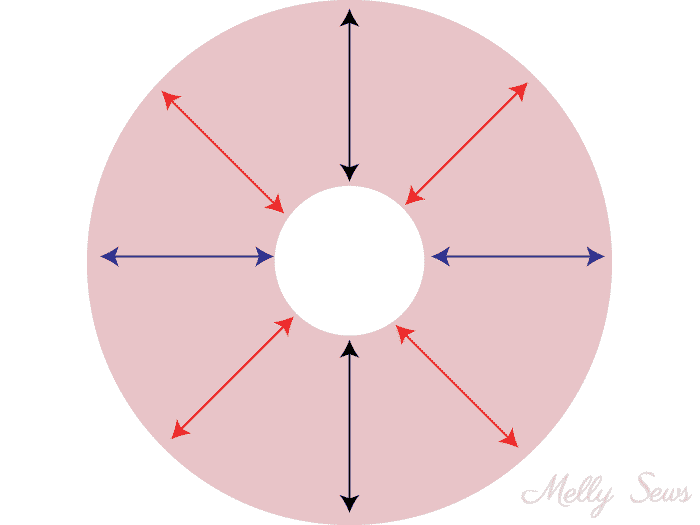 And the illustration below shows what happens with the grain in a circle skirt. The black arrows show the straight grain, which runs parallel to the selvedges. The blue arrows show the cross grain, perpendicular to the selvedges. And the red arrows show the bias grain, which is at a 45 degree angle from both the straight and cross grains. Why is grainline important? Well, the grainlines drape and stretch at different rates. Think about how bias tape can stretch slightly, even though it’s typically made of woven fabric. Add gravity and you can see how the hem that was even when laying flat becomes uneven when hanging. Which is also why it’s a good idea to hang a full skirt overnight before hemming. This happens to a greater or lesser extent based on the drape of the fabric, the weight, the weave, and the type of skirt. All other things being equal, a line skirts will have less of an issue, circle skirts will have a bigger issue. And pencil skirts generally don’t have this issue at all. So how do you deal with the unevenness? Well, first, if you are using a fabric with a lot of drape to make a very full skirt, allow extra fabric at the hem. You can always cut it shorter, but you can’t add fabric at the hem easily. Next, I lay the skirt flat and do a quick hack of the parts that are very obviously longer, as shown below. At this point, it’s important to try on the skirt. 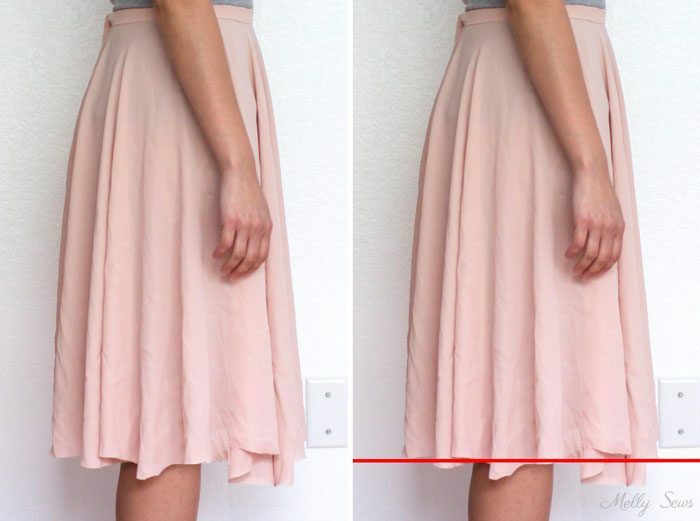 This goes for any shape skirt – try it on before hemming to make sure the front and back are even. Generally, skirts can hang unevenly because of junk in the trunk or muffin tops or a whole host of lower body shapes. So try your skirt on, let it flow over your lower half, and then mark the hem. This is one of those times that it helps to have another person or even a dress form so that you can mark the hem. But when you’re working alone without a form, here’s another trick. It works better with a washable marker than with a chalk pen because less pressure is needed to get a mark. Once you have it all marked out, then you can lay it flat and evenly cut the hem. And then see this post to decide on your hemming method. 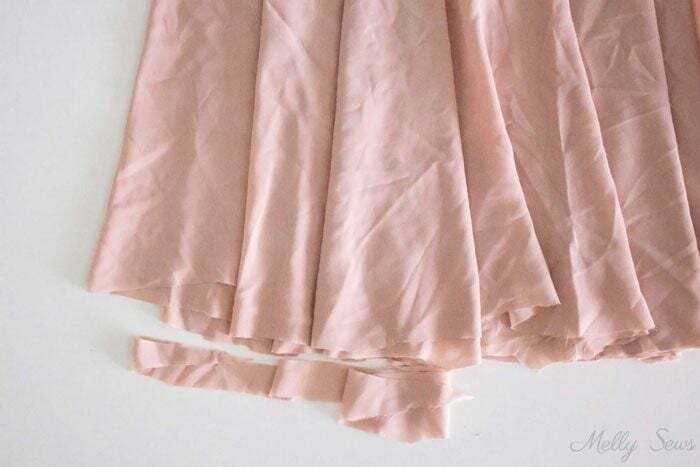 Did you line this skirt? Love the marker taped to the wall. Very clever! I have no words….BRILLIANT! STUPENDOUS!!! GENIUS!!!!! Who’da thunk it…. 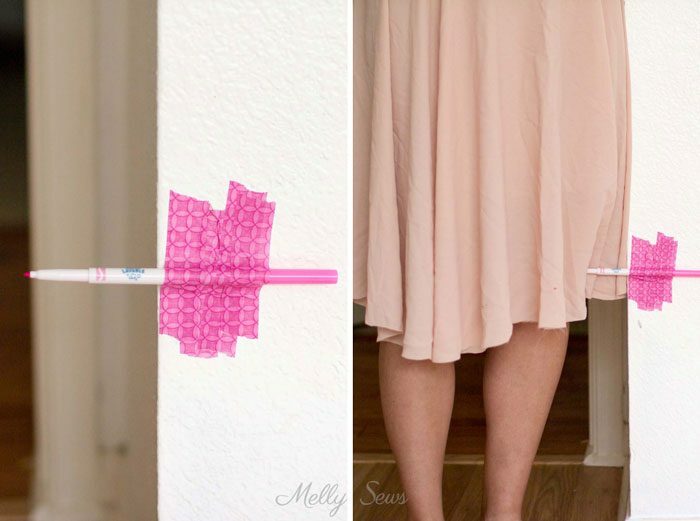 TAPE a frickin MARKER to the WALL to self hem!!!!! Ahh. I feel like I’ve come across the most amazing discovery since sliced bread. Thank you!! I thought it was too late since I’d already sewn all the other seams, and I’m working on some circle skirt-eque culottes that have SO MUCH fabric I can’t really lay it flat on the floor to cut. A good way to shorten when it turns out too long too! Whaaaaat?? I’ve sewn for over 65 years and NEVER seen this marker on the wall trick. 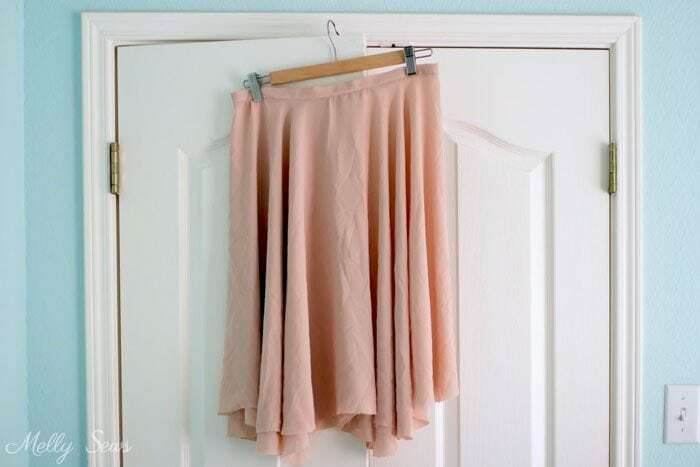 Makes me want to go right out and make a skirt so I can try it. Love ‘ya! !